Sheep aren’t stupid. They’re almost as smart as pigs, and at about the same level as cattle. Sure, they won’t be writing any heartbreaking novels of staggering genius or winning on Jeopardy anytime soon, but they’ve been domesticated by humans for at least 12,000 years, and as a consequence, one might imagine they have a pretty good idea what they need to be afraid of. The average sheep knows that if he makes it past his lambhood without ending up doused with tzatziki on a gyros he can look forward to a good dozen years of rumination while hanging with the flock. Milk and wool are after all, the sheep’s gift that keeps on giving. They have a bit of a public image problem in that numerous religious traditions consider them the go-to sacrificial animal, but by and large humans have spent a lot of time and effort protecting them from predation. While wild felines, bears, birds of prey, ravens and feral hogs consider sheep a scrumptious snack, historically their primary predator have been the canids, particularly wolves. And humanity has not been kind to wolves as a result. About the only thing we domesticated before sheep were dogs, and their relative warm wooliness probably contributed substantially to our ability to migrate to the colder climes outside the Fertile Crescent. You don’t get to be the icon of pastoral peacefulness unless you can shed your cares and wander the fields free from fear. Curiously, on the fateful evening in November 3, 1888, something collectively scared the bejesus out of tens of thousands of sheep in Oxfordshire, England, a bizarre event that has not been adequately understood to this day. Two local seed import/export men named Oakshott and Millard in Reading, which seemed to be the epicenter of the event, sent a letter to the editor of the popular Hardwicke’s Science-gossip magazine detailing the event and wondering if anyone could offer a plausible explanation. The Sheep Panic near Reading — I beg to call attention to a remarkable circumstance which occurred in this immediate locality on the night of Saturday, November 3rd. At a time as near eight o’clock as possible the tens of thousands of sheep folded in the large sheep-breeding districts, north, east, and west of Reading were taken with a sudden fright, jumping their hurdles, escaping from the ﬁelds, and running hither and thither; in fact, there must for some time have been a perfect stampede. Early on Sunday morning the shepherds found the animals under hedges and in the roads, panting as if they had been terror-stricken. The extent of the occurrence may be judged when we mention that every large farmer from Wallingford on the one hand, to Twyford on the other, has reported that his sheep were similarly frightened, and it is also noteworthy that with two or three exceptions the hill-country north of the Thames seems to have been principally affected. We have not heard, nor can any of the farmers give any reasonable explanation of the facts we have described. The night was intensely dark, with occasional ﬂashes of lightning, but we scarcely think the latter circumstance would account for such a wide-spread effect. We would suggest the probability of a slight earthquake being the cause, but, perhaps you or some of the readers of Science-Gossip may be able to offer a more satisfactory explanation – Oakshott and Millard (Hardwicke’s, 1889, p70). Simply put, across some 200 square miles of prime Oxfordshire sheep grazing territory, tens of thousands of sheep went crazy, fleeing for their lives. Nobody felt an earthquake. The weather wasn’t especially bad, but meteorological, seismological, and even astronomical (meteorites) causes were immediately discussed as the source of the “Night of Horrified Sheep”. None of these natural explanations were deemed convincing, although a number of contemporary natural scientists were quick to point out that historically a lot of weird stuff seemed to drop from the sky onto Oxfordshire, particularly in November. Mr. W. White has kindly disinterred the following note from British Rainfall, 1868, where it has been buried for nearly 20 years. What with the meteor at Wantage, April 9th, 1628, the under-mentioned one November 3rd, 1868, the one November 20th, 1887, reported upon by Mr. Fordham, and the sheep panic November 3rd, 1888, it really seems as if residents in that district in November have exceptional opportunities for meteorological research (Great Britain, 1888, p170). This was a tough nut to crack for the skeptics, since it’s hard to miss all the sheep in Oxfordshire stampeding for no discernible reason. 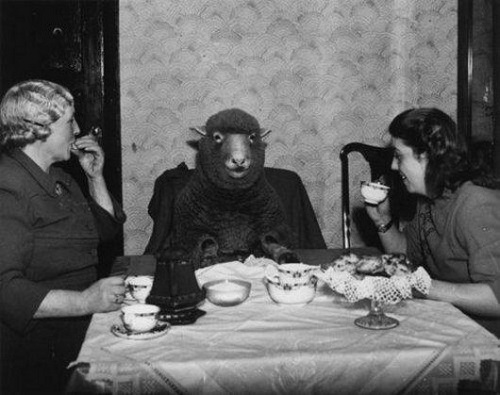 The sober analysts at the Live Stock Journal, no doubt a hard bitten bunch of expert shepherds, attempted to offer an insight into ovine psychology, pointing out how easy it is to panic a flock of sheep, uncreatively labelling the mechanism of contagion as “hearing” and suggesting that this all resulted from it being a “very dark night”. Sheep Panic — the case reported from Reading, as to the whole of the ﬂocks within one district being disturbed and escaping from their folds on one night at one hour, has been paralleled, by a similar outbreak in Norfolk. As we believe, the panic is spread by “hearing.” Flock M or N is frightened on a very dark night. At once L and O are disturbed, ‘and the sound of their excitement attracts the attention of K and P, who are simultaneously panic-driven, the distress expanding from one center, as the rings upon the surface of a pond expand from where the stone strikes the center (Live Stock Journal, 1888, p627). Given this hypothesis, one would expect a lot more massive sheep panics, yet in general most sheep appear to be well-adjusted and rarely take anti-anxiety medication. One hopes a field animal can cope with a little darkness. Charles Hoy Fort noted the 1888 case, and pointed out that not only were the explanations offered for the sheep panic largely inadequate, but that yet another equally unexplained, large scale sheep panic occurred in 1893 in nearby Berkshire. The shepherds of Oxfordshire were equally puzzled when the sheep went nuts again in 1893, and suffered through the same unsatisfying suggestions that seismological or meteorological events startled their poor animals. Tens of thousands of them. Across a few hundred square miles. Various causes for these panics have been suggested, but hitherto no reasonable one has been satisfactorily adduced. On the night of December 4, 1893, another very remarkable panic among sheep occurred in the northern and middle parts of Oxfordshire, extending into adjoining parts of the counties of Warwick, Gloucester, and Berks. Individual farmers on finding the next morning that their sheep (almost all sheep in this part of the country are folded or “penned” on turnips on the arable land at that time of year) had broken out during the night, and observing that the condition of the pens and hurdles, as well as of the sheep themselves in some cases, pointed to the fact of the sheep having been severely frightened, naturally concluded that they had been worried by a dog; some, finding that the sheep exhibited no marks of being worried, concluded that they had only been frightened, perhaps by a dog, perhaps by a fox; others applied to the police. The result of any inquiries made by the police, or privately, or by mentioning the fact among neighbours, however, was to elicit the fact that the panic had extended over a very large tract of country, and that unless it was allowed that all the dogs and foxes in the district had with concerted action simultaneously arisen and attacked hundreds of flocks on the same night, this attempt to account for the panic would have to be abandoned. The panic was then attributed by all flock-owners (save one, who seemed very loathe to exonerate some sparrow-catching boys!) to some atmospheric or meteoric cause, or to an earthquake (Alpin, 1894, p130-131). The idea that “darkness” scared the sheep that seemed so obviously dismissive in the 1888 case, was trotted out again in the 1893 reoccurrence (because again nobody felt an earthquake, heard a meteor crash, or noticed anything especially odd about the weather), although to be fair, they did suggest that not only was it dark, but “really dark” on the night in question. Various causes for these panics have been suggested, but only one reasonable explanation has been satisfactorily adduced. The 1893 panic was, at the time, fully investigated by Mr. O.V. Aplin, who published in the Journal of the Royal Agricultural Society the result of his inquiries, and the conclusions he drew from the extensive evidence collected. The conclusion arrived at was that the cause of the panic was simply thick darkness. Very few people, probably, have ever been out in a really dark night, and it is impossible for anyone who has not had this experience to imagine what it is like and the sense of helplessness it causes. That a thick darkness of this kind was experienced in the early part of the night of the recent panic (at a time agreeing with that at which, so far as was known, the sheep stampeded), was proved by abundant evidence. One report said that it was between 8 and 9 P.M. when such a thick and heavy darkness came on that a man could not see his own hand. Another witness wrote that a little before 8 o’clock there was an extraordinary black cloud travelling from north-west to south-east, which appeared to be rolling along the ground. The darkness lasted for thirty or forty minutes, and during that time it was like being shut up in a dark room. Later in the night—long after the panics—there were several flashes of lightning. Mr. Aplin states that animals probably see perfectly well on ordinary dark nights, and we can imagine a bewilderment coming over them when they find themselves overtaken by a thick darkness in which they can see nothing. Folded sheep (and it was the small folds that the sheep broke most) in moving about would knock against their feeding-troughs and one another, and the first one that got a fright from this and made a little rush would probably come into collision with one or two others, and it would need nothing more to imbue the whole pen with the idea that there was some cause for fear. Then they would all make a rush, and their terror and the momentarily recurring incentives to, and aggravations of, it in the shape of collisions would only subside when the sheep had broken out and were in the open, clear of one another and of their troughs and hurdles. If this is the explanation of the panic, then it is easy to understand why folded sheep are so much more likely to suffer than those lying in open fields. The heavy, oppressive atmosphere accompanying the thick darkness, the susceptibility of sheep to atmospheric disturbance, and their nervous and timid dispositions would all tend to increase the fright the sheep experienced. The cause of the panic being a cloud rolling along so low down as (apparently) to touch the ground, the tops of the hills and the high-lying ground would naturally be most affected; and this is observed to be the case, although locally the usual direction followed by thunderstorms has indicated a line along which sheep stampeded on nearly every farm (Scottish Agriculture, 1921, p204-205). When one person experiences something anomalistic, we’re awfully comfortable attributing it to insanity, hallucination, misidentification, or any of a number of highly individualized psychological problems. When crowds witness bizarre phenomena, miracles, or other inexplicable events, it takes fancy footwork to react with the same sort of dismissiveness, thus we’ve had to invent a range of collective maladies like “mass hysteria”, proposed to operate by vague naturalistic mechanisms that are very nearly as far-fetched as the phenomena we are trying to explain away. This is yet another trap of skepticism, proving that it that can simultaneously disparage the value of the individual witness as “anecdotal”, while maintaining that, as English rhetorician and logician Richard Whately said, “Men are like sheep, of which a flock is more easily driven than a single one”. All I can recommend is that if you see 20,000 sheep fleeing down the road in terror, it’s really not the time to assert your individuality. Follow them. Alpin, O.V. “Panics in Sheep”. Journal of the Royal Agricultural Society of England v55. London: Royal Agricultural Society of England [etc. ], 1894. Fort, Charles, 1874-1932. New Lands. New York: Garland Pub., 1941. Lockyer, Norman, Sir, 1836-1920. “Notes”. Nature v39. [London, etc. : Macmillan Journals Ltd., etc. ], 1888. Great Britain. Meteorological Office. The Meteorological Magazine v23. London: E. Stanford, 1888. “Letters to the Editor”. Live Stock Journal v.28. London: Vinton, 1888. “Notes and Queries”. Hardwicke’s Science-gossip: An Illustrated Monthly Record of Nature, Country Lore & Applied Science v.25. London: R. Hardwicke [etc. ], 1889. “Sheep Panics”. The Scottish Journal of Agriculture v.4 (April), 1921. What was in those black clouds moving so close to the ground? Perhaps they contained birds confused by the darkness, flying so close to the sheep to frighten them. Are migrating birds active in England during November or December? If so, a large flock of them might have lost their way when they flew into the black clouds. That’s as plausible an explanation as any, but what I found curious is that the Oxfordshire locals themselves really didn’t see or hear anything odd to account for the sheep behavior. The most recent post as of today, “Rationalists are Harshing My Empiricist Mellow” which I’m reading the blog backwards from, explains Mr. Heck’s explanation. 🙂 There were no reports of birds, but surely birds present a rational explanation, even if they weren’t there!